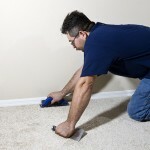 Has your carpet become loose or lumpy over time? While this is a common problem, it can be fixed through the simple steps of restretching your carpet. If you would prefer not to hire a professional for this task, it can easily be done yourself by following the steps below. Restretching your own carpet has the added benefit of allowing you to work around your own schedule and time frame. By planning ahead, you can accomplish this job in one day or less. The first step in restretching your carpet is planning ahead. Choose a day to devote to the task, and determine what tools you will. Restretching a carpet requires a few specialized tools which can likely be rented from your hardware store. The most important tool is the power stretcher, which will do the stretching for you. For areas close to the walls you will need to use a knee kicker. While carpet can be cut with a utility knife, consider renting a carpet cutter to be more precise. You will need a pry bar to remove the existing tack strips, a stapler to reinstall your carpet pad, and tin snips or a chisel to cut new tack strips to hold your restretched carpet. Other common tools such as a hammer, pliers and screwdrivers will be needed along the way. Once you have collected the needed tools, you are ready to begin. Before you can restretch your carpet, you must first remove both it and the carpet pad from your floor. To do so, start in one corner of the room. Use pliers to lift the carpet from the tack strip underneath, taking care not to harm the carpet in this process, and peel the carpet back from the rest of the tack strips. Next, remove the staples from the carpet pad using a screwdriver and pliers so that the pad will not rip as you take it out. Finally, remove the tack strips from around the room. 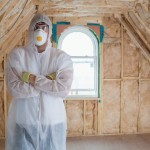 Consider wearing gloves during this task to protect you from the nails. If you are removing tack strips from a wood floor, use a pry bar inserted under the tack strip and the nails to pry the strips from the area in which you are restretching your carpet. If the floor is concrete, use a chisel to remove the strips just outside of your project’s area before prying out the wood. Then use a hammer to hit the concrete nails sideways and break them off, as they will not simply pull out. You will begin the process of reinstalling your carpet by laying down new tack strips. 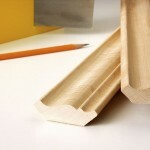 Tack strips are bought 4 ft. lengths, so use the tin snips to cut them as needed for your room. When purchasing tack strips, be sure to buy ones that have concrete nails if you have concrete floors or one with standard nails if your floors are wood. Next put your tack strips in position. The distance of your tack strips from the wall should be half the thickness of the carpet. Make sure that they are aligned correctly with the carpet-gripping nails facing the wall to hold the carpet in place and that there are no gaps between strips. Secure the tack strips to the floor by driving the prestarted setting nails in place with a hammer. 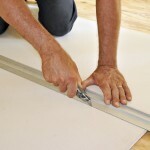 If an overhang makes it impossible to access the nails, attach the tack strips to the floor with a construction adhesive, waiting overnight to ensure that it has set. Once the tack strips are in place you will install your carpet pad. Trim it so that it will sit against the tack strips, stapling at 3 in. intervals along the edge. Finally, you will restretch and install your carpet. Lay the carpet across the floor to the edges of the room. Cut diagonally from the corners, cutting from the underside of the carpet. Use your utility knife to cut off most of the extra carpet, leaving about 3 in. excess. Next, position the power stretcher, using its extension sections to adjust it to the dimensions of your room. Brace one end of the power stretcher against the wall. The other end has a head with teeth, which you will dig into the carpet about half a foot away from the edge. Use the dial to specify the depth the teeth will dig – the deepest option is usually most appropriate. As you push the lever down, the teeth will hold and stretch the carpet. While the carpet is stretched, push it into the tack strips before releasing the lever. With the knee kicker, you will then set the carpet and stretch in places the power stretcher is unable to fit. Set the knee kicker 6 in. from the edge of the room and use your knee to kick it against the wall. Then push the carpet into the tack strips. Stretch the carpet working around the room lengthwise first, starting from the centre and working out. Begin on the side of the room with a door. Use the knee kicker on one side of the room and then stretch to the opposite side. When the carpet is in place, the final step is to cut off excess using a carpet cutter or utility knife. Once this is done, you have finished restretching your carpet.